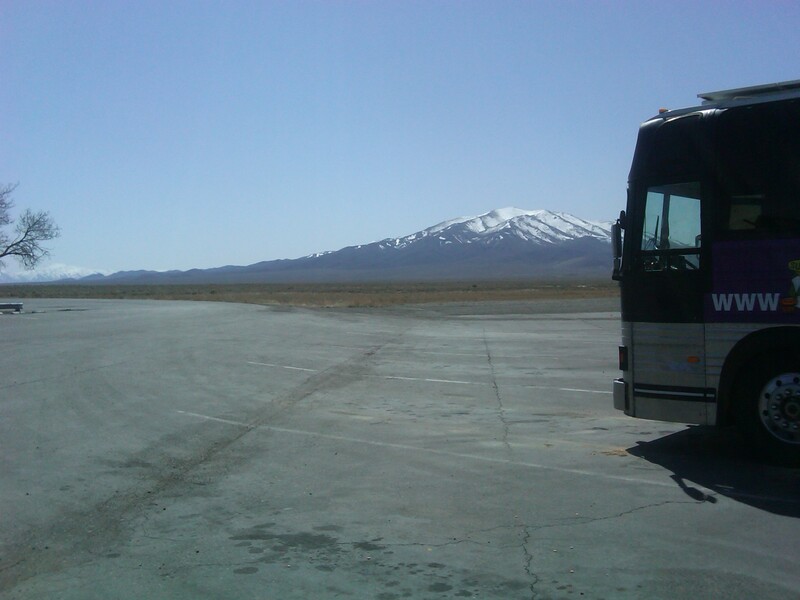 Here we are with the first installment of Lia’s ramblings, Spring Tour 2010. The bus departed our Oakland office at around 9 pm last night after months of planning and weeks of the hecticness building to a crescendo. That crescendo for me was, due to a series of delays, having to receive and process all of our tshirts to bring on tour with us. We’ve got 7 bangin’ new designs that you can scope most of at our little shop soon. After I processed those 1,500 shirts in 5 hours (OUCH! ), Julia, our faithful bus from the Sustainable Living Roadshow (formerly the bus of Julia Butterfly Hill) arrived and we packed it all in. Tom from SLR is our temporary driver until we hit Colorado to pick up our sound system from PK and our lighting rig from Brown Note. Last night we drove past Reno, reliving our years of middle school angst to the blast from the past that is the four Cranberries albums on my ipod (Tom still belting all the words after a 9 year Cranberries hiatus, and my joining in on the chorus.) We summited Donnor pass in the moonlight, and I wondered why they named everything there after the Donnor party. Now, who doesn’t go to Donnor Lake or drive down Donner Lane without thinking about explorers cannibalizing each other? We’re somewhere in the Nevada desert at this point, making good time. So, what’s new on this tour? I’m not going to speak to the lighting or sound, as we all know it’s something you have to experience for yourselves (see videos in previous post.) We’ve got a new driver, Andy, who will hopefully NOT get us stuck in the busiest YMCA parking lot in America at 6 pm on a weeknight (sorry Pete, you were a trooper.) We’ve a collaboration with Adbusters distributing free issues at the merch table, the last few of a white label vinyl safely in my drawer on the bus, a fancy, (nordic?) earplug dispenser (yes, wear earplugs, 110 dB is unhealthy for unprotected ears,) a live art station for anyone who wants to come scribble their scrabbled mind, as well as the Timestretch EP in transit and a SICK poster featuring the Timestretch Hummingbird by one of our favorite fans, Peter Clark. Things are looking good, our 60 feet of bus and trailer are purring loudly along. I’ll be working merch most nights so come say hello, grab some earplugs and scope the shirts. Stay tuned to the tour blog for my weekly video rap-up, and blogs whenever I have a chance to write. Hit our iphone app for my favorite feature, an amalgamation of all of the crew’s twitter feeds, for instant updates on the show, photos, and assorted silliness. We’re on the cusp of 5 weeks on the road, and you’re invited.